Just did a sold out show at Dixon Place as part of their curated series. On to the Players Club, PRESENTED BY WHITE HORSE THEATER COMPANY in assocIATION WITH DR. MIRA SHIN. Tickets are on sale now for PLACES AT THE PLAYERS CLUB. MAY 10th, 8 pm. Check out the rave reviews! Soon to be released, Downrange, playing Shirin, an Indian mother battling with cultural identity in modern America. Do you know what was here? 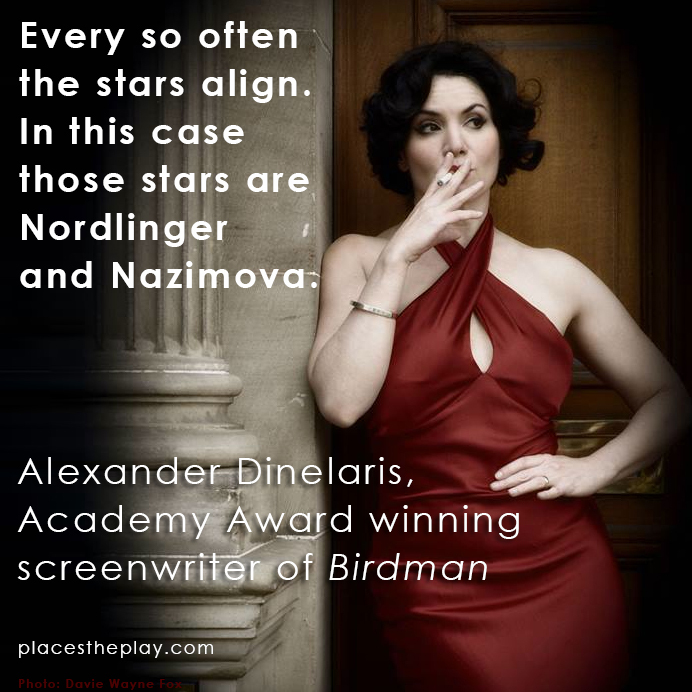 The Broadway Theatre named after Alla Nazimova may no longer be, but our stories are our power. Outside West 39th Street's former Nazimova Theatre, now a parking garage and Irish Bar. Romy performed an excerpt from her solo show PLACES in the Untold Stories of Jewish Women festival at the Museum of Jewish Heritage, March 20th. For the first time, live accompaniment by the composer, Nick T Moore from his beautiful score! Recently performed her original solo show PLACES about silent screen star Alla Nazimova, to sold out audiences and critical acclaim at 59E59 then on to the Edinburgh Fringe! Watch for upcoming shows of PLACES. She also recently wrapped a two day co-star shoot on Bull with CBS. Romy's busy narrating her 210th audiobook with many more on the queue! Some Off-Broadway credits include Ginger in Lancelot by Steven Fechter (The Woodsman), and she’s in pre-production for the Lancelot feature film, Shakespeare's Slave at the Clurman and Caligula at The Kirk Theatre Row. Regionally she's performed at Actors Theatre Of Lousiville, Wilma, & Shubert amongst many others. Recently Romy voiced the role of Edna Hoffman in Florence Foster Jenkins directed by Stephen Frears, and many diverse roles, from grandma to geisha in China's highest grossing international blockbuster Monster Hunt, by the creators of Shrek. Film, TV and web include: The Ruthless Spectator with Rob Bartlett, Law & Order CI (Officer Talbor), All My Children, One Life To Live, WOMG, plus numerous indie films including the searing drama A Separation. Member of the League Of Professional Theatre Women, NY Madness, Playwrights Gallery, Dramatists Guild.